What can I say ... it is the time of year that touches something so deep and hidden inside me I totally forget what it feels like until it stirs when seeing such beautiful Autumn colours even in my own back yard with my junior Tiger Eye Sumac tree ... Baby TES is in the wrap bed and has already lost it's leaves as have my teenager TES Sumac .. some how junior has held on to make me smile and I love it! Another wonderful event is that the horrible "Black Tar Spot" that infected my Pacific Sunset Maple has finally begun to work it's way out of this lovely tree and we see far less of those spots ! The gardens are losing their foliage but in such a colourful way it softens the blow of what is to come. So working my way through ... tucking in bulbs and mulching doesn't seem to be such a sad process. 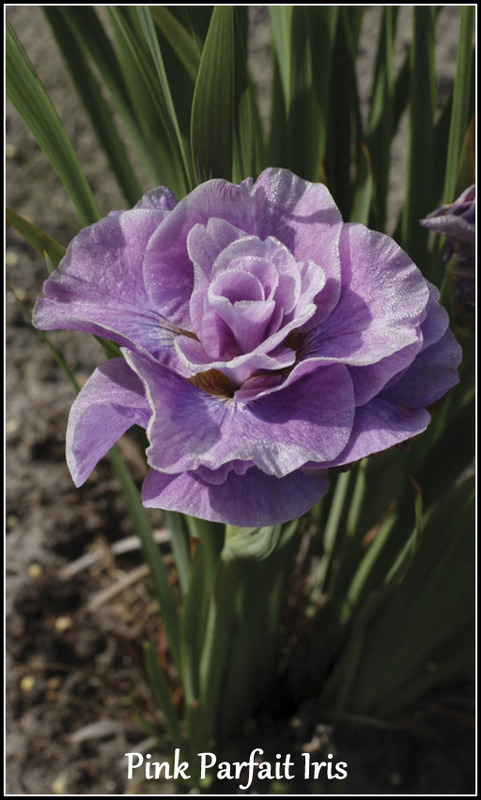 I am actually fixated on how pretty the bulbs will look in Spring. 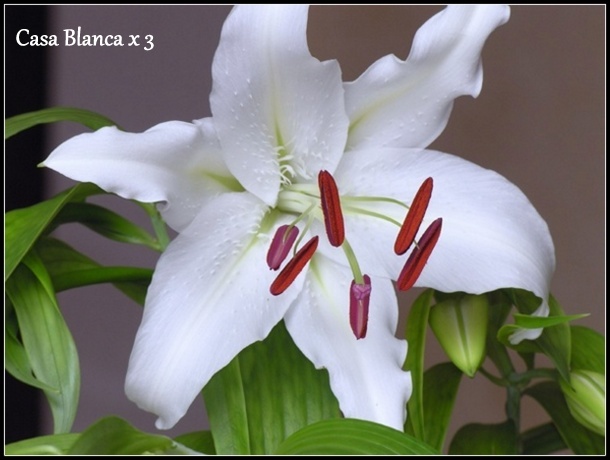 I thought of this planting on the fly but I am so hoping it will look like I see in my imagination. Inner circle of those dramatic "black" Queen of the Night surrounded by gorgeous multi flowering Antoinette in shades of yellow, orange, peach ... in resounding contrast. Can you see these beauties surrounding each other too ? Fingers crossed the two of them will look as beautiful as in the picture ? The tiny pink buddliea will look amazing if they can make it through the winter ! This heuchera will be so much more colourful in the Spring .. it will look amazing with the irises! A completely new bulb for me is the Sicilian Honey Garlic flower ... tall and umbrella shaped head. Things look rather bare right now in this area .. I moved "Piglet" pennisetum to an area where nothing much will thrive at all so I am hoping grasses will. In the ally way my Costco special of tall alliums have been planted to camouflage the gas pipe line. Along with the white gooseneck loosetrife when it pops up with assorted grasses hosta and ground cover. I was so happy that the Guacamole hosta allowed me to split two good sized chunks from it. I so thought it would be a major disaster when I went at it ... thank you "mole'" !! This area is mulched and put to bed ... one more thing on the list and done ! 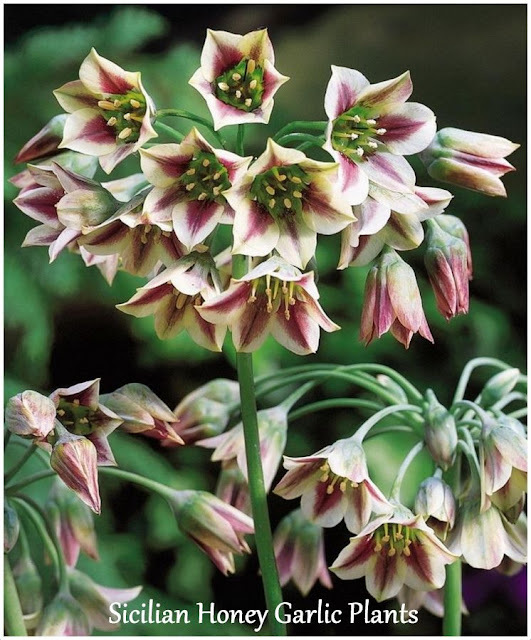 I planted more Schubertii allium lining the sun strip .. this picture from the net doesn't do it justice but I was in a hurry ... and I still want to shout from the roof tops how amazing this flower is. I am totally in love with it still ! 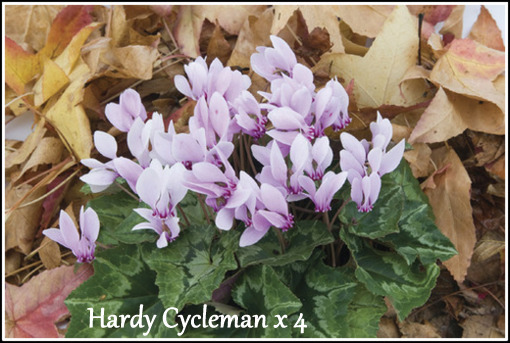 Hardy Cyclamen is a new one for me .. it is in the renovated area I am still working on to shove a few more hosta in and hope for the best .. after ready Jennifer's post (Three dogs in a Garden) on an amazing gardener Margaret and her son David ... her tips and tricks especially the ammonia/water solution to get rid of slugs ... well I have to try that one for sure !! Thank you ! I planted three more Casa Blanca by my lonely "one" at the head of the shade garden .. you can't have a garden without these beauties ! So what do I do but add another sort of beauty in the garden (as of yet I don't know where) but here it is! Now how girlie can a lily get I ask you ?? I can't wait to see what it will be like or where I finally plant the three bulbs ! This one was for my wonderful Garden PA ... he really likes Spring colours and this pretty much fills the bill plus comes as a lily flowering tulip which is what I love about it .. I haven't found the right spot for them yet but I will ! 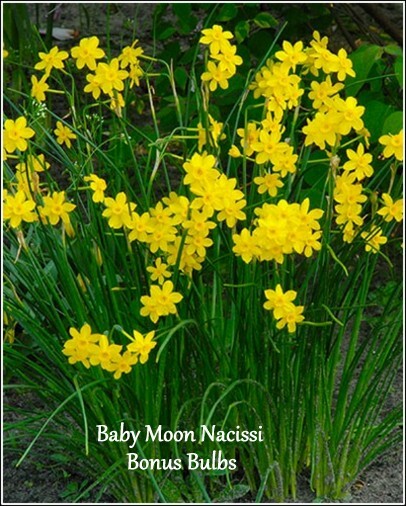 Botanus gave me a little present for being such a good customer ... some Baby Moon narcissi ! I guess I better wrap this up for now .. the next two days seem to be good for finishing my chores so I will be trying like a madwoman gardener that I am to do so. I just thought posting this would keep me motivated and keep a record of what I am doing which is a good thing for some one who flies by the seat of her garden jeans most of the time I am in the garden? .... Phew !!!! You have been so busy! You make me feel like a slug. I haven't planted one darned bulb. Our ground is so hard due to the drought that I can't get enthused yet when I see all of your plans and plantings...If I could go out and buy some right now I would do it. 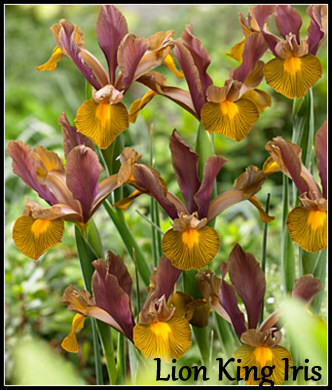 :) I can't wait to see what your plantings look like next spring. Joy, you planned very interesting new plants for your garden. 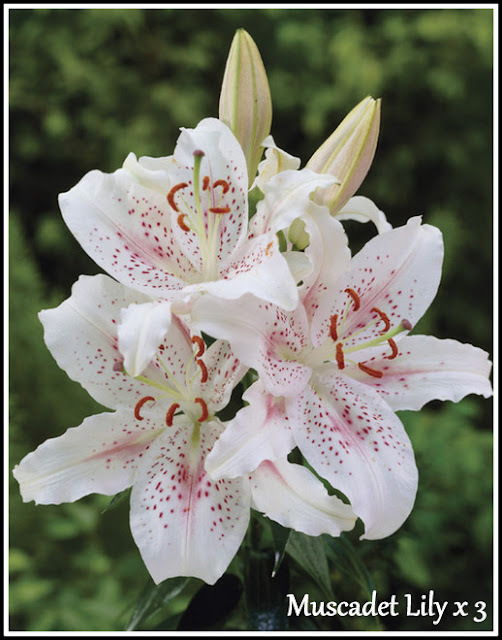 I can say I have Muscadet lily, I planted three of them between rhododendrons and it was very nice: when rhododendrons don't bloom lilies flower long enough time - 2-3 weeks. I also had Sicilian honey and they bloomed short time and were not as tall as I wanted. Last fall I didn't dig them up and they disappeared. You have a well planned garden. Like the labels on the pics...smart move. I'm impressed that you have your head into spring already but you've always plan for future seasons. The redesigning of my garden beds (thank you Kai-squirrel and rabbit hunter) has me a little crazy but I have to work with it. For someone who flies by the seat of her gardening jeans you sure do a good job! Your photos are always so inspirational. I love the bulbs you tucked in. I actually purchased a package of 'Baby Moon' this year because I've heard that they're fragrant. I love that. Your lilies ooh la, la. 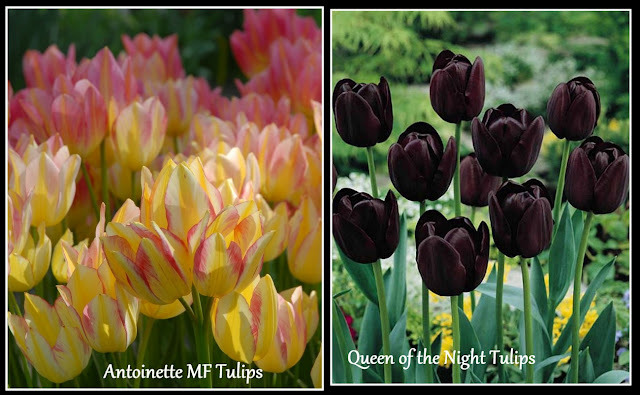 And those tulips, I can't wait to see everything blooming in your beautiful garden. I hope you're doing well my friend. Love and hugs. Cindee girl I hope you have had some rain by now .. that picture of the Princess walking on such dry ground was sort of sad .. hope it improves !! I can't wait to see what happens either! Hello Nadezda girl and thank you for telling e about your experience with the muscadet lilies .. this is my first try with them and I am hoping I won't see too many beetles ! The Sicilian honey/garlic bulbs are a first for me too .. so I have no set expectations with them .. and if they only last one season that is ok with me .. such is garden life! Glad you survived the colonoscopy ... the prep is always the hardest thing to do. Patsi girl you will be able to plan around the great little hunters .. you just have to show them who IS BOSS ? LOL .. it will all fall into place .. gardeners can't stop thinking of future plans , although the garden is the only thing I can't think of in those terms. Thanks Gracie girl ... I couldn't do it without my garden jeans! haha .. I just hope it all turns out like my head sees it .. and yes those Baby Moon are supposed to be very fragrant so I am anticipating some lovely vibes from them : ) Hope all is well with you too! Rose girl I was just over to your place and that gorgeous maple is perfect. A planting we will go ! You have to get this sumac and I just know the perfect place will dawn on you when you get it! What beautiful plans you have for your garden. I can never get mine layered right. New tulips bulbs are in a box just waiting for me. They have been waiting and waiting. LOL! We finally got some rain so it will make planting them easier.Now to get me up and about it. :) Have a lovely week. Thank you so much ... it has been a good working month in the garden for me. hey ... this is a first for me to be so in tune with getting things done this time of year. The rain does help so much .. glad you are finally getting some ! Just go at your own speed girl : ) Take care ! 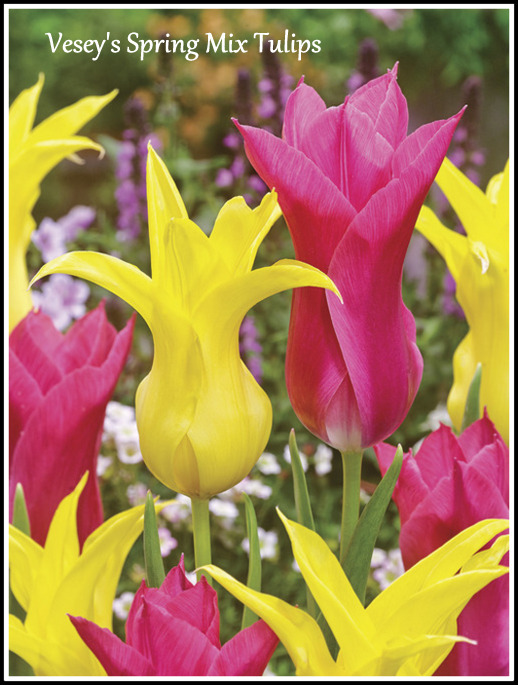 Yes, focusing on how the spring bulbs look is a good way to take your mind off of what's to come, that long, dark, cold season whose name we dare not say aloud. Just talked with my niece in Alaska where it's currently snowing. Brrr! Looking forward to seeing all of your spring blooms! Hope you had a great Halloween Joy. Can you believe we didn't get a single kid on Halloween? (It's the nature of where we live.) I so miss the little princesses and goblins at the door! I have all my bulbs in, but sadly it isn't because I am actually organized this year. No, it is because I didn't buy that many. Next spring I am sure I will be sorry I didn't hunt harder for some clearance sale bulbs. But before I dash out and look again, I promised myself I would get a few last minute chores done first. Then maybe I'll add a second round of bulbs. One of the items I wish I had more of is alliums. Won't your garden be nice with the ones you've planted Joy! 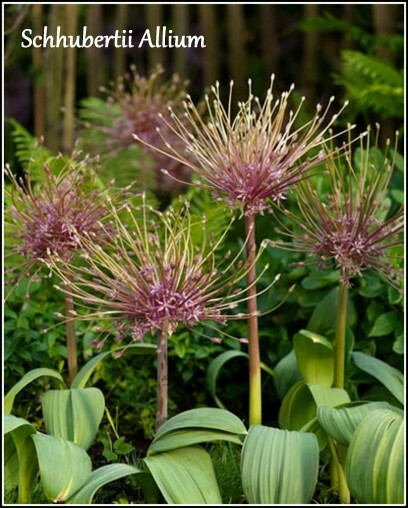 Alliums are an indispensable bridge between tulips and early perennials. A few weeks ago I saw a Tiger Eye Sumac on sale and bought bulbs instead. After seeing your pretty Sumac in all its fall splendour, I wish I hadn't been so cheap. They take on the most amazing colors don't they? Thanks for the mention by the way! I hope Margaret's hosta slug treatment works for you. I understand the brakes on bulbs girl .. most years I am like that .. this year I went totally MAD HATTER and bought too many .. I just hope they all come up so I can see them ? I am so curious to see if the allium seeds you gave me will pop up .. I really want to see them .. I also had 15 large ones from Costco I planted in the same area so fingers crossed. OMG ... I can't imagine a garden of mine without a sumac .. I just happen to have three Tiger Eye ones in various stages of maturity .. baby, toddler, teenager ! haha my toddler had the best show ever this year : ) I meant to ask you if you had ever tried Margaret's slug solution? ... I am so curious to see if it will work !.. I know the copper wire necklace didn't ... argh !! !